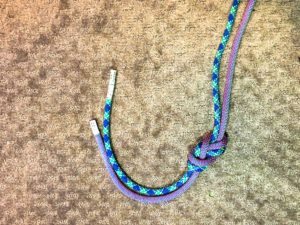 There has been much controversy over the flat overhand knot, otherwise know as EDK (Euro Death Knot) for rappelling in the media lately. Much of the controversy has to do with the “rolling” of the knot, and most of the time it is actually the flat figure eight that everyone is talking about. 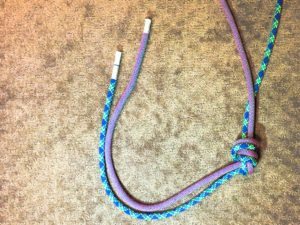 I have recently even seen the flat figure eight called the other version of the EDK, and now there is an article called “A Better EDK.” These of course are published by well-known American climbing magazines. So lets first get the names of the knots correct. Because we should stop calling any knot a Euro Death Knot, but if you must, use that term to describe the flat figure eight knot. 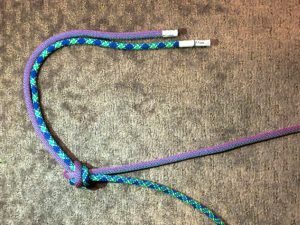 It is really easy for me to give you instances of when and when not to use these knots for the weekend warrior climber. Flat Figure 8 should be used, never. Use a flat overhand when rappelling. Since we only should be using one of these knots, let’s talk about the properties of a properly tied Flat Overhand. Pulled every strand to tighten. -Greatly differing diameters of rope. -One really new rope and one really old rope. -Any combination of the above. Remember to put knots at the ends of your rope! Why not stick with what is known and proven? Why is everyone always trying to change something that works just fine? The problem is that the moniker “Euro Death Knot” implies that the flat overhand knot is dangerous, which causes people to use other types of knots like the flat 8, which IS indeed dangerous to rappel on. and why is the flat 8 dangerous to rappel on? Because it capsizes under about half the load a flat overhand does. Here is one of the many tests out there. Take the tails and tie a double fisher mans (grapevine) knot on either side of the “Flat Overhand” for extra safety. This should take less than 30 seconds to do both sides. The name “Flat Overhand” is a relatively new name for the knot. We used to call it an “overhand joiner knot”. Tying fisherman’s knots in the ends defeats the very purpose of the Flat Overhand, which is to have a simple, elegant, and safe knot for rappelling. It also increases the likelihood of getting the ropes stuck. Is it possible that you meant a forearm’s length with regard to adequate tail? An arm’s length seems overkill. For the skeptics, the Flat Overhand has been the norm in European climbing for decades. I recall questioning a partner about it once, more then 15 years ago – to which he responded, I’ve been using it for 30 years. Tie it well, and don’t look back.